The Center for Disease Control and Prevention gives us a look at preventing tobacco use, statistics of tobacco use, factors of tobacco use, and reducing youth tobacco use. 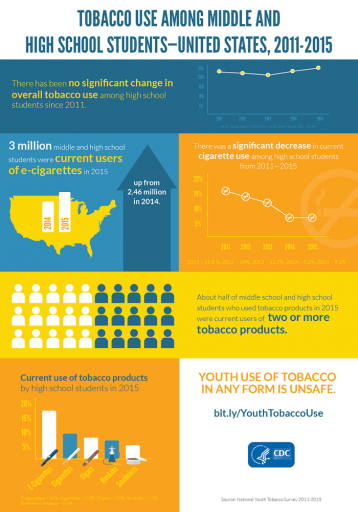 The U.S. Department of Health and Human Services presents charts and data about middle and high school students in the U.S. regarding the current trends of tobacco use. This website offers information about what to do, hot topics, and fast facts about tobacco prevention. It also offer a youth based program to help keep tobacco out of the hands of youth, youth advocacy, tobacco prevention in schools, and information about helping youth people quit smoking. CADCA’s online tobacco use prevention toolkit that gives you strategies to help you prevent and reduce tobacco use in our community.